Cedar shingle siding brings to mind a home at the beach, weathered by salt and sand, or a home in the mountains with snowdrifts reaching the windows. Two reasons people choose cedar shingle siding for these types of homes are its durability and incredible natural beauty. Not just for vacation homes anymore, cedar shingle siding is being used on homes in cities and suburbs. It is blended with stone veneers, stucco facades, or used by itself on every type of home, from one story ramblers to magnificent mansions. Cedar shingles are available in different shapes, also. Squared off cedar shingles offer a traditional look, and rounded-bottom or pointed-bottom shingles present a more unique look for your home. 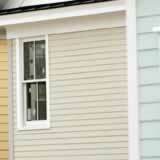 Cedar shingle siding can last for many years with proper care. If you enjoy the look of its distinctive charm and want something long-lasting, consider it for your next remodel project. You could feel like you are living in a vacation home every day of the year.